In this bio-recipe we will analyze how significant is an alignment. This will be done by comparing the real alignment against alignments made out of shufflings of the same sequences. First we define the file name where we can find the SwissProt database and then load it. We also create Dayhoff matrices to be able to align sequences. We align the two sequences using a local alignment, to align the best subsequences. ID=C72E_ARATH   AC=P58051;   DE=Cytochrome P450 71B14 (EC 1.14.-.-). !! :.|::::|:.:! !.:..:. ..:.||||..:| !|||.|:: ::...|. ||. ::!|:::||:|  :::||::..
:||:  :::..|..|.|...:||::: !:..:!! :     !|.:..||:!:.:. ::  !:.:.:.:|!! ||  ..:.:. |..::::. .|:::.:. :....|:. !| . ::|. :|:|:: | :| :::.::.! !:. ::: ||: |::.|::|:!.. !|.:|.|.!::|.|!.|||.:.. ...|..:!.!.:.||:|:.|:..!||! !|:.:|! .:!.|! |||.|.!!:|! Then we shuffle randomly the amino acids of both sequences and align them again. We repeat the random shuffling and alignment many times, so that we can have some reliable values for the average score. First we would like to have some information about how to shuffle sequences. This code uses the variable s which is assigned a structure to collect univariate statistics. Now we can print the results onto the screen (in plain characters), or we can see them as a web page (other possibilities, like Latex are also possible). Global alignments are really poor (forcing the entire shuffled entries to match), so we may try Local alignments, that is the best subsequences that match. 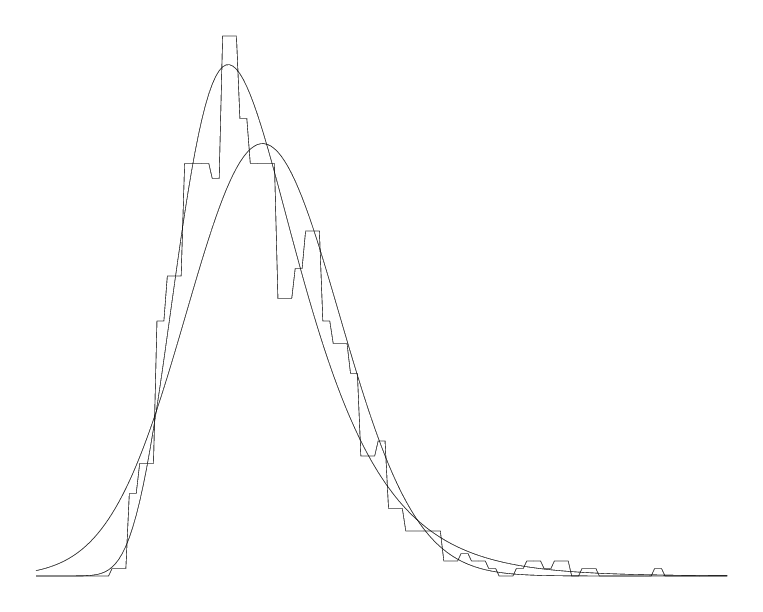 At this point we also want to create a histogram of the scores, to have a visual clue on their distribution. The histogram, which is produced as a postscript file, can be viewed on a separate window. If we want to focus the histogram on the part where all the significant scores happen, we select the values between 35 and 80. This corresponds to a p-value which is smaller than 10^-400 and thus can non longer be represented using IEEE floating point representation. By visual inspection, we realize that the Gumbel distribution fits our data much better. Finally, we can also estimate the p-value with respect to the Gumbel distribution of our initial alignment. Note that we made use of the expx1 function. This function computes exp(x)-1 and is numerically much more stable for x close to 0. And the final conclusion is quite clear, a random alignment would never have the score that we obtained, nor anything close. The reason for the high score lies in the homology of the sequences.